The Professional Repair Kit is the most complete and most versatile circuit board repair kit you’ll find anywhere. It’s the total package. 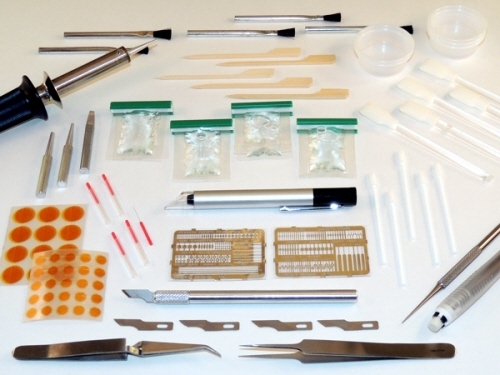 The kit includes dry film, epoxy-backed circuit frames, and unique replacement circuits that require no messy liquid epoxy. 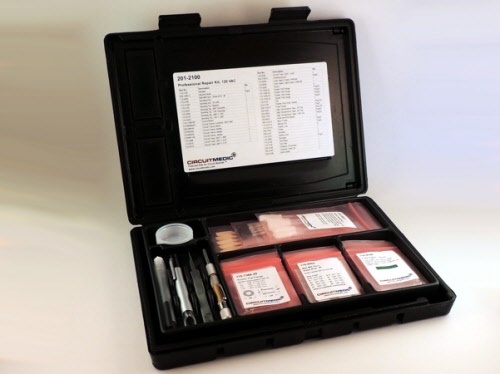 There are eyelets and setting tools for plated through hole repair, Circuit Tracks to repair damaged circuits, epoxy and color agents for solder mask or base board repairs, and a comprehensive manual…all packaged in a convenient carrying case. If you need to repair damaged circuit boards, the all-in-one Professional Kit is just what you need. Note: For small (under .040” wide) surface mounts and BGA pads the Circuit Bonding System is recommended to more precisely control the bonding force. 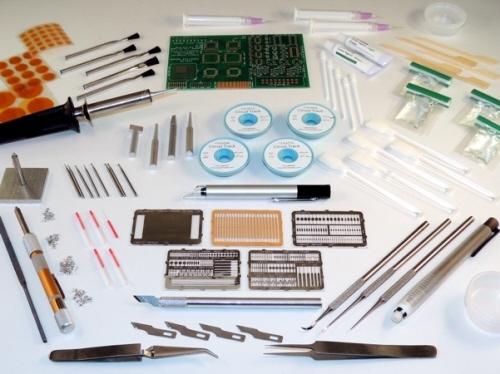 This kit includes the tools and materials needed to reliably replace damaged surface mount and BGA pads. The unique Circuit Frames are made from rolled, annealed copper electroplated with solder and finished with dry film adhesive backing. You simply select the appropriate size pad, trim it from the Circuit Frame and bond it to the circuit board surface. 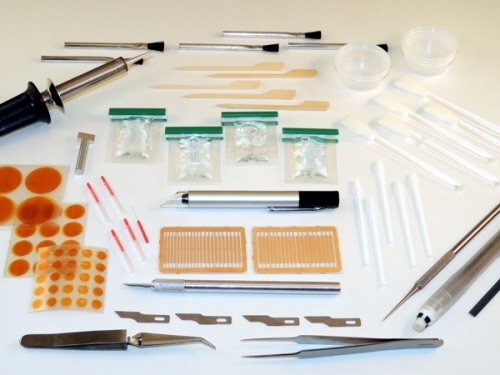 Included with the kit are a bonding iron and tips to match the various sizes of the surface mount and BGA pads. A multifunctional epoxy is included for over coating the lap solder joint formed between the replacement pad and connecting circuitry. Step-by-step instructions for replacing surface mount and BGA pads are outlined in the manual included with each kit. This manual is an excellent tool for repair technicians and covers techniques that can be used in a variety of repair applications. Note: When gold edge contacts become contaminated with solder consider using the Gold Contact Plating System.